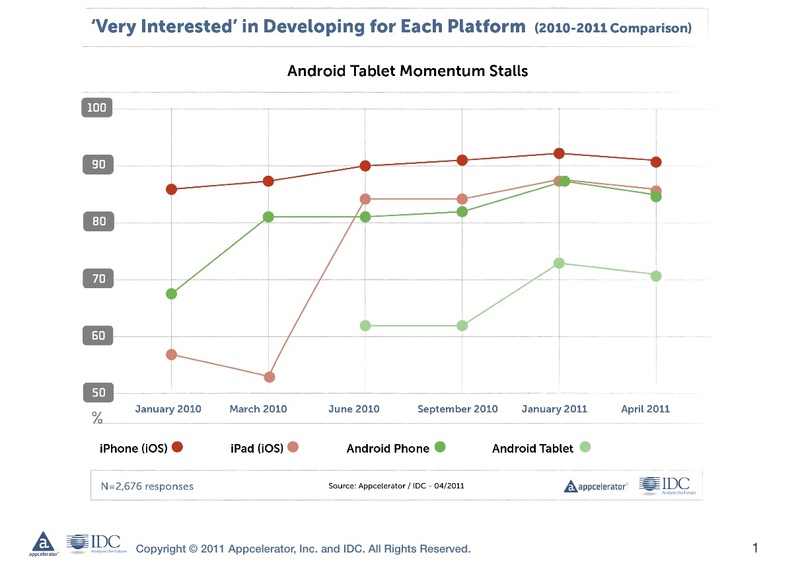 Developer interest in Android (s goog) appears to have cooled off due to concerns about fragmentation and questions about the first wave of tablets based on the operating system, according to a new developer survey from Appcelerator and IDC. The results show that interest in Android has slowed, though it doesn’t appear that developers are any more interested in third-place options after it and iOS (s aapl). The latest quarterly survey, conducted between April 11 – 13, found interest in developing for Android phones dropped 2 points to 85 percent, while interest in Android tablets fell by 3 points to 71 percent after recording a 12-point jump in the last survey in January. Meanwhile, iOS support continued to be strong, with 91 percent of developers very interested in iPhone development, and 86 percent similarly interested in developing for the iPad. The two iOS devices recorded one-point declines in interest since the last survey, but neither was as bad as the Android dip, where interest has been growing more aggressively until now. 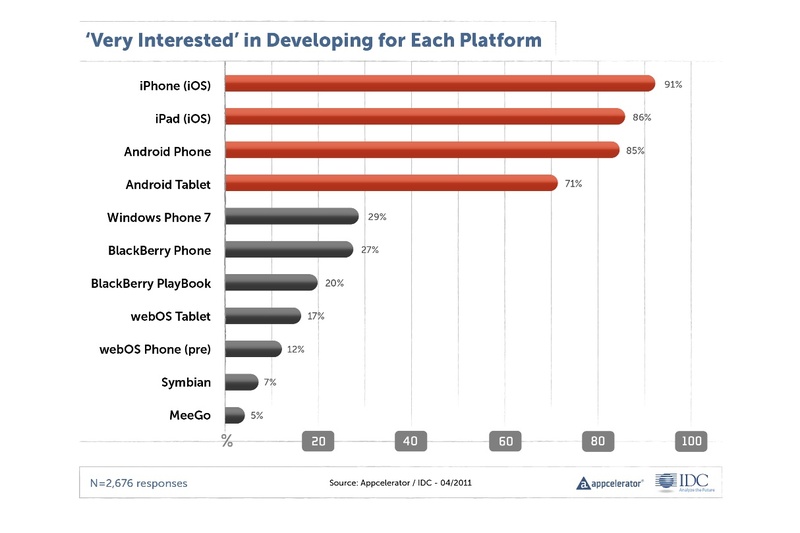 The survey polled about 2,700 developers who use Appcelerator’s Titanium platform to develop for mobile. With support for Android slowing, it would seemingly open the door for a third platform to step up, and Windows Phone 7 (s msft) is showing the best promise, moving ahead of BlackBerry (s rimm), with 29 percent of developers saying it’s the third most popular OS. But Windows Phone 7’s position change belies a seven-point drop in interest from developers. Microsoft’s mobile OS still fared better than BlackBerry, which dropped 12 points to 27 percent. The lack of interest in a third platform seems to be driven by the perceived impossibility of any competitors to catch up to Apple and Google, something almost two-thirds of respondents (62 percent) agreed was in fact true. Another 46 percent said they had their hands full with iOS and Android. This suggests the emergence of a real third-place challenger isn’t going to be easy, with so much time and energy spent on the two leading platforms. Even with Microsoft’s big Nokia (s nok) announcement, it lost seven points of interest from developers. Competing platforms are going to have to get even more creative and potentially open their wallets even further to court developers if they want to compete with Apple and Google. So why is Android hitting a wall? It appears growing concerns over fragmentation are holding some back. Sixty-three percent of developers said device fragmentation was Android’s biggest threat. Weak initial momentum for Android tablets (30 percent) and multiple Android app stores (28 percent) were also cited as concerns. Looking deeper, it appears device fragmentation issues around Android are part of a larger discussion around mobile fragmentation concerning skills and OS capabilities, which are actually bigger concerns for developers. But with device fragmentation particularly acute for Android developers, it adds a headache iOS developers don’t have to deal with. Developers are also losing interest in Android based on the first wave of tablets introduced. Just 52 percent were very interested in the Samsung Galaxy Tab, while 44 percent are very interested in the Motorola Xoom (s mmi) and 31 percent in the HTC Flyer. Scott Schwarzhoff, VP of marketing for Appcelerator, said Android developers appear to be put off by the higher prices of Android tablets, which don’t seem to bring enough hardware features and polish to justify their price tags. It’s still very early in the mobile platform races, but developer support is key. Apple is likely to remain near the front of the pack for many years to come because it has the most loyal developer community. Android clearly has a lot of sales momentum, which has made it No. 2 in developers’ eyes behind Apple. But Google clearly has more to do to smooth over concerns and stimulate further momentum. Interestingly, though, Android’s rough edges may be stifling alternatives. Android developers are spending a good amount of time handling the device fragmentation issue, meaning they have less time for taking on a new platform. Again, it’s still early, but competing platforms are going to have to show developers reach, a good developing environment, and attractive money-making opportunities to take down (or even just catch up to) Apple and Google. So far, no one seems up to the challenge. Very nice this shows fighting between these mobile companies will definitely decrease the price of these great mobiles indirectly people will be happy at the same time which company reduce the price and with best features of mobiles they will be in the first place obviously so we shall see who will be in the first place and also the companies must prove themselves that they are developing the mobiles with greatest features for the people not for the money. Google has abdicated any economic proposition for developers, unless it’s freeware/ad-supported. Look at the lame Android “markets” filled with hobbyware and compare the blogs and stats coming from devs w/apps on both and it’s orders of magnitude more income for a small company to ship iOS goods. Do we need 1000x Droid-things to reach income parity? It looks to me like everything has “cooled” because they all seem to have dropped by the same amount. Android tablets haven’t really even begun yet.